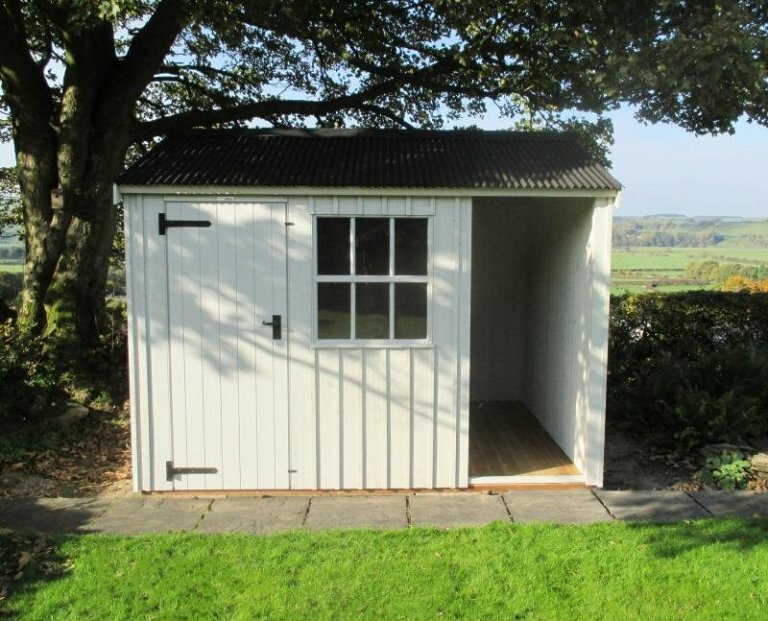 This National Trust Blickling Garden Shed is 2.4 x 3.0m in size, and it has been installed in our customer’s garden in the rolling hills around Lancaster, Lancashire to use as a helpful garden storage area, as well as a sheltered space to keep logs for their fire. In the National Trust range, the Blickling, as well as the Felbrigg and Peckover, has got an apex roof, which is the more traditional look with garden sheds. If you’re looking for a pent roof, you may want to look at the National Trust Oxburgh Garden Shed. These sheds are traditionally styled, having been designed based on old outbuildings on National Trust property estates. Traditional features include a black corrugated sheeting to protect the roof, Georgian windows, roughly cut vertical sawn boards for the external cladding, and black cast iron door furniture. 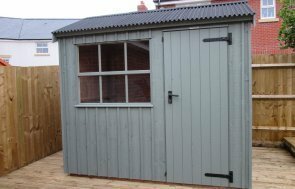 To finish off the outside, the shed has been painted in Earls Grey, which is a pale, neutral colour from the National Trust paint range. Available in a wide range of sizes, we can tailor your building to include extra features. 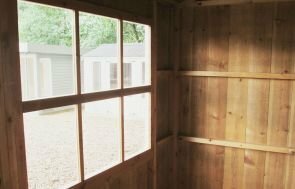 For more information on our garden sheds, along with the other garden buildings we offer such as summerhouses, garden rooms, studios and greenhouses, we encourage to take a look around our website.